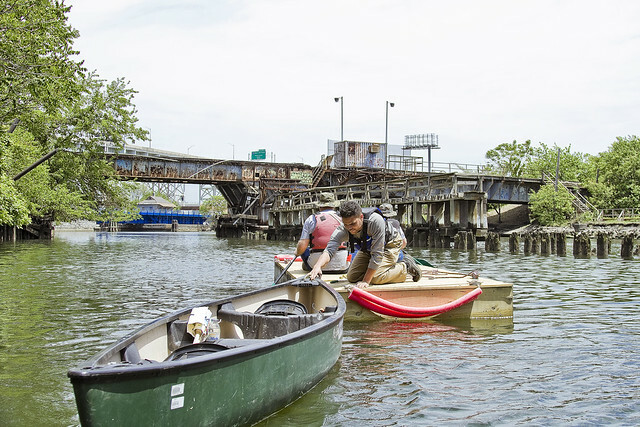 More on the dock delivery dilemma at Dutch Kills with HarborLab, in today’s post. 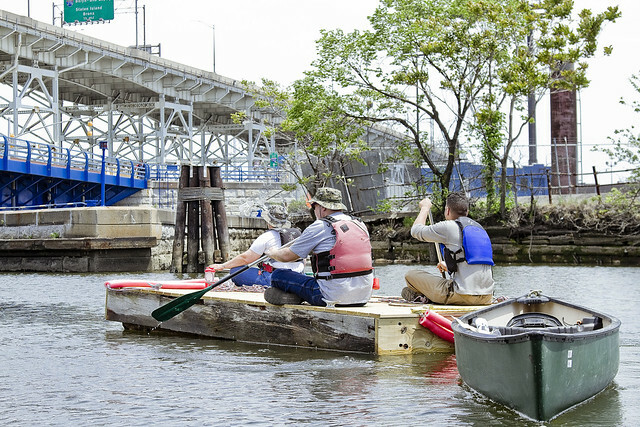 Once we passed under the derelict railroad swing bridge – DB Cabin – at the mouth of Dutch Kills, it was pretty much smooth sailing for the crew from HarborLab to steer the new dock designated for the usage of faculty and students from LaGuardia Community College to its destination. Dutch Kills is about a mile long, and flows back towards Sunnyside Yards in direction of Queens Plaza. 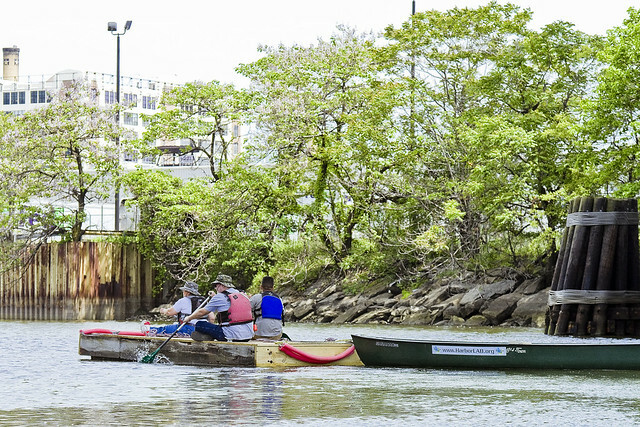 In its primeval incarnation, this tributary of Newtown Creek once had several tributaries of its own, and fed a swampy wetland that was nearly 40 square acres in size. 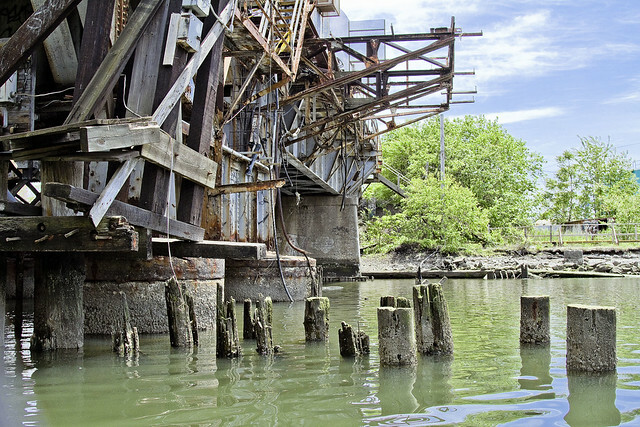 It terminated its navigable path at about 29th to 30th street and 40th avenue in the neighborhood of Dutch Kills. That’s across the street from St. Patrick’s Romanc Catholic Church and around a block from where Jackson Avenue becomes Northern Blvd., if you need a landmark. The waterway was truncated to its current bulkheads in the first decades of the 20th century during the construction of the Sunnyside Yards, Queensborough Bridge/Queens Plaza, and the Degnon Terminal. The second movable bridge over Dutch Kills is a single bascule rail bridge called Cabin M.
Before you ask, and I’m talking to you – George the Atheist – I have no idea where the naming convention on these bridges originates from, and would suggest that there is an enormous community of rail fans out there on the interwebs who could likely fill you in on every detail about the LIRR’s Montauk and Montauk Cutoff tracks. Also, and this goes to GtA as well, check out that rusty patina. Looking back at DB Cabin, for a view unavailable from the landward side. You can check both of these bridges out from Borden Avenue, but the view of DB Cabin is occluded by Cabin M.
As with all things LIC involving maritime industrial water, there is an advanced state of decay present here in the infrastructure. Rotting piles, remnants of an earlier time when clear eyed Mariners plyed these waters, abound. 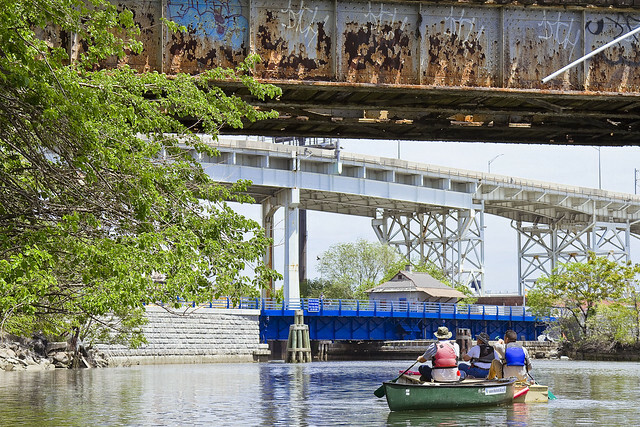 Passing under Cabin M, the redoubtable Borden Avenue Bridge and the Queens Midtown Expressway section of the Long Island Expressway come into view. Borden Avenue, or at least this section of it, was constructed in the late 1860’s as a plank road for horse and donkey carts through the “sunken meadows” and was built to connect coastal Hunters Point (which was virtually an island back then) with upland properties in Blissville and Maspeth. Accounts of the sorry condition of pack animals who crossed this plank road are found in historic anecdote. Horses, oxen, and donkeys were described as emerging from the low lying path – beginning their climb towards the Maspeth Plateau at Greenpoint Avenue – covered in a wriggling gray coat of mosquitoes and other biting insects. When the pests were brushed away from the pack animals, the critters were covered in a sheen of blood. These insects were a plague even to the riders of the Long Island Railroad, who described what they perceived as smoke rising from hundreds of camp fires on evening trips along the tracks. The “smoke” was actually multitudes of insects rising into the air from watery nests. 19th century Queens was notorious for waterborne diseases like Cholera, Malaria, and Typhus. 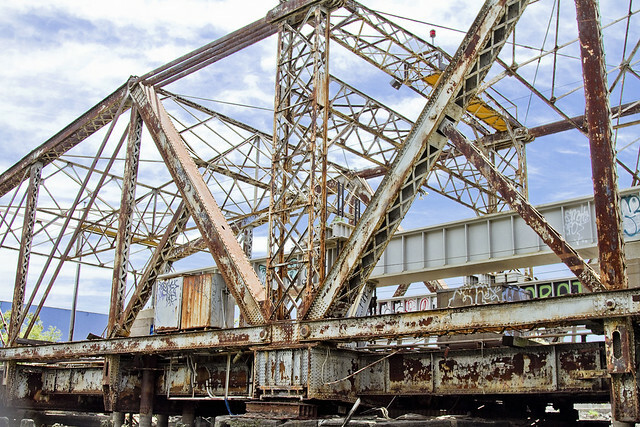 There was a succession of wooden structures that were called Borden Avenue Bridge, an iron swing bridge which carried trolley traffic was built in the late 19th century and removed in 1906. The modern bridge was opened in 1908, and it’s a retractile bridge. 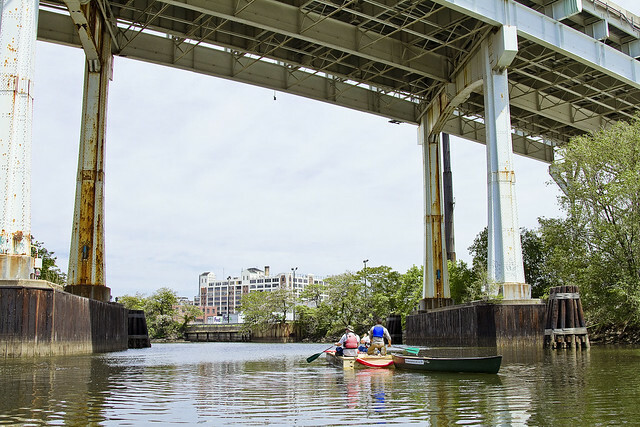 Retractile means that the roadway pulls back from the waterway, and the only other bridge of this type found in NYC is at Caroll Street, spanning the Gowanus Canal. 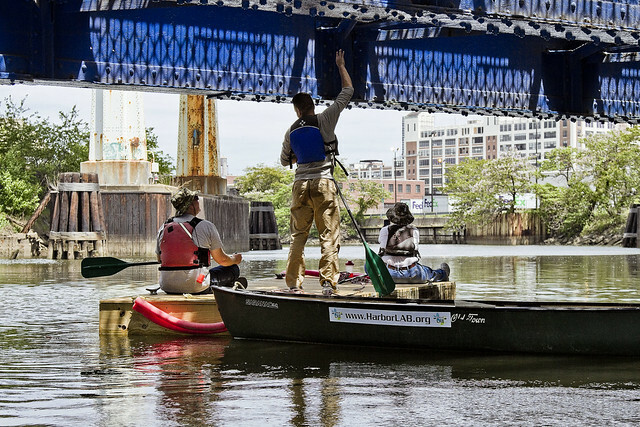 Retractile Bridges are actually quite common in Chicago. Opened in November of 1940, the Queens Midtown Expressway section of the Long Island Expressway is some 106 feet over the water, and it is the “high speed” road that feeds traffic into the Queens Midtown Tunnel. 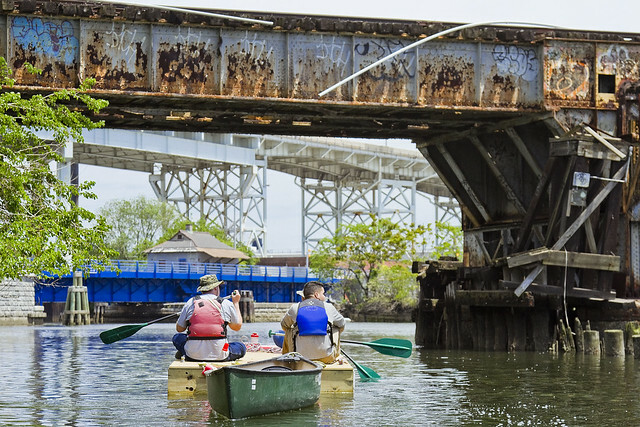 In tomorrow’s post, we get to cross under the last movable bridge on Dutch Kills and enter the loathsome waters of the Turning Basin. on the Creek or sections thereof?